I can't find a screencap of this character just yet, as the movie was released only very recently. But every now and then in scenes set backstage at the Muppet Theatre, there's a sheep chowing down on some non-food items, either in the background of the shot or at the very end of the scene. It's just a little (ADORABLE) sight gag. Is the sheep a character from past Muppet films or TV shows? Does it have a name? As far as I can tell, it isn't one of the sheep listed here. So who is our little sheep friend? Found a screencap. I'm not sure which iteration of the Muppets this screencap is from, but it sure ain't the 2011 movie. The sheep in question is blurrily visible on the second level in the background, just above and a bit to the left of Kermit's head. It appears to be gnawing on a cowhide. 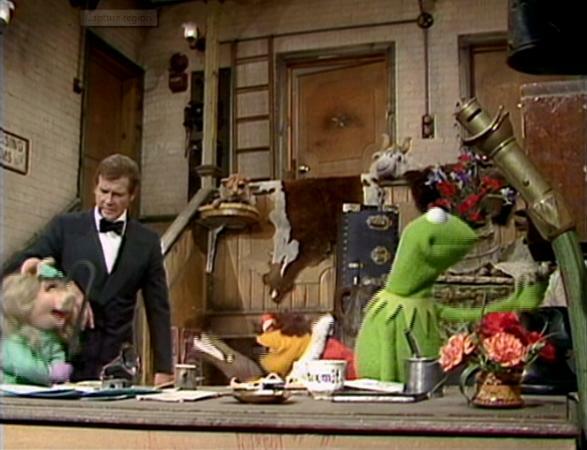 The sheep doesn't seem to have a name but the screencap shows Roger Moore who was a guest on episode 5.24 of The Muppet Show in 1980, so it's not new to the recent film. An assortment of sheep, including rams and lambs, were featured on The Muppet Show. The first one debuted in the U.K. Spot "Is This the Old Sow" on episode 415 of The Muppet Show, while more sheep made their appearances on episode 417, during the song "Rama Lama Ding Dong." During the Muppet News Flash for episode 418 a "killer lamb" that had escaped from the zoo attacked the Newsman, and another falls on him (following Mary) in a Disney Xtreme Digital short. Not the answer you're looking for? Browse other questions tagged muppets .